Great idea but my inventory is all screwed up. This has been a problem for a while. Anybody have a suggestion for a better app? I have used the app successfully for several years. But in no longer works. You can still scan the barcode. It brings up a list including the bottle of wine you are researching. But when you select the bottle from the list, the app crashes. This is now happening with every bottle of wine I scan. Please fix. The app is useless at this time. Once a year I re-download the app and see if it has gotten any better. Nope. There are too many shortcomings to list. I like the way I can keep track of bottles I own, as well as what I have liked in the past. They information is useful when I'm in the store deciding what wine to buy. Well, that did not work at all! Inside the wine store my phone has no network connection, and Corkz says it can't work without network. So all I get is a black screen. Why is my wine cellar not stored on my device? I need it to work regardless of network. There are still many places on this Earth without network availability, and my apps need to work there. Doesn't work. At all. Thanks for the upgrade. Not at all. "Loading". All day. I looked around for a while to find the "right" cellar app for my needs. This one has a good balance between community, extensive line of wines already available for selection and ease of maintaining my personal cellar. Most of the the time the app has everything I need. The web site has more functionality. I usually only use the web for editing my cellar, for which the app seems limited. The app is great for adding to my cellar and consuming from my cellar, but revisions to what is in my cellar not so much. All in all, I'm happy with it. The shortcomings are not significant. I've used this app for over 2 years and it has worked wonderfully in sorting/tracking my cellar, until the last several months. Now it either won't load/open or takes forever to load. If it does load, it works great. Sad to see such a good app fall into this state. Been using this app for a couple years. Was a reasonable way to manage my cellar tracker data base. The current version and iOS 9.3.5 do not work together. The app spends most of the time in "loading" but then fails to load with time out. When it does load it you can't search by cellar location. Does not show all cellar or shelf locations in my cellar tracker DB. In addition you can't add to your existing cellar because it doesn't show cellar locations available (cellar and shelf names are blank). Not good. Current app is unusable for tracking or updating. I had this app running on my iPhone 5 and now 7+ for 3 years and was reasonably happy with it. Unfortunately, it stopped working a month ago. Nothing has worked to resurrect it. I contacted the company, but no response. I give it only 1 star because i cant get the developer's attention. When it works, i would give it 4 to 5 stars. Don't purchase this app! They have very few wines listed, and the years are way out of date if they do have it. Difficult to navigate. Very laborious to find a wine (many step process, compared to other apps that just use a photo of the label to identify it). Some wine regions only have wineries that start with A and B. No C though Z! Crazy. And they don't respond to customer support requests. Can't do much on the app, not even input price you paid or add bottles that it doesn't have. It has also lately been working off-and-on, perpetually loading when clicking on a wine in my cellar. 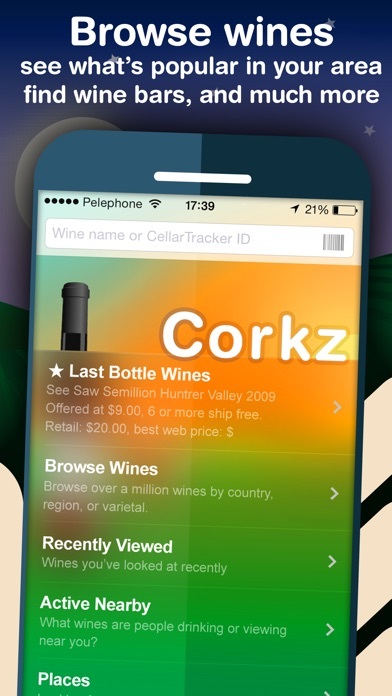 Cork.z is my favorite app to keep my cellar organized through Cellar Tracker. Great info, easy to use. All around very solid. This app works well enough to choose and mark off the wine you're having with dinner. I use Cellar Tracker for data entry and management, but the Corkz UI is easier to use IMO. Would be a 5 if the back-end were more reliable. Would be nice if it worked half the time. Getting a never ending loading screen is not encouraging. I'm actively looking for an alternative to this pain in the... app. Outstanding database. Does what it says it will - no fuss, no muss. App used to be great. Used it every day. Now it just crashes. Shame. This version has some more great improvements. Keep them coming. Love the app when it works. Some reliable issues. The app is very helpful in conjunction with cellar tracker. However, it does crash more than I'd like. Synchs with cellar tracker. The community ratings of the wine is very helpful. This App isn't loading after last upgrade. Agree with the above comments. Love the app when it works, it now will not work on my phone. I loved this app when I first purchased it. Now, every time I try to enter the app, it kicks me over to CellarTracker, whick I HATE!!!!! Not user friendly at all. Unable to retrieve any of the over 100 bottles of wine I had entered on the Corks app. Suggestions????? 11/14/2016 update must be performed from the App Store. Letting the App take you to the store will result in a cyclic failure loop. App can't launch anymore after the last update. Get an error 503. Please fix it. What happened to the compare button?? This was a five star app, and now with the newest update, they have removed the compare button. 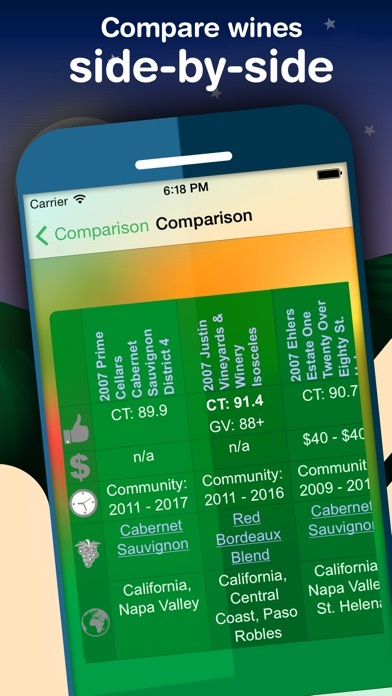 You used to be able to compare wines of different vintages side by side, and now that feature has been disabled. PLEASE add that back to the app, and it will go from a 3 star app back to a 5 star app. ...to Cellar Tracker. Depending on your individual wine storage situation, this app will range from "somewhat useful" to "can't live without it." The best use for me is being able to locate a wine in my cellar, "drink" the wine (which can include rating it and sharing on social media, as well as writing private or public notes. This process also "removes" your consumed wine from your inventory---all this without having to boot up the desktop or iPad version of Cellar Tracker. Cellar Tracker still excels when adding wines to your inventory. All this works very well, and the periodic bugs are usually exterminated in a reasonable period of time. Not a bad program, but there is still a lot to be desired. No attempt was made to create a real database of popular wines. It is clear the designers are awaiting us to do their work. Not cool, but again, not a bad program. I have been using this app for a couple of years. I have a couple of hundred bottles in inventory. The program will not open and deleting it will remove all the data. I'm done. Very useful tool to keep track of purchases and when to drink. If I had enough to worry about location in my cellar it would help with that also but I drink them to fast lol. Definitely helps when shopping for new wines also. Amazing app that is an easy data entry "app" that is backed by a full featured web site called Cellar Tracker. So you enter your personal cellar data via the Corkz app and some of the editing is done via the Cellar Tracker website. The beautiful part of this app is it syncs with all your mobile devices almost instantly. So my Iphone and two Ipad 2's have my cellar information synced all the time. Awesome! and it works perfectly. It took me a bit to figure out that some editing had to be done on the Cellar Tracker website so if you enter data via the app and want to change it, some fields can be changed within the app but not all fields. 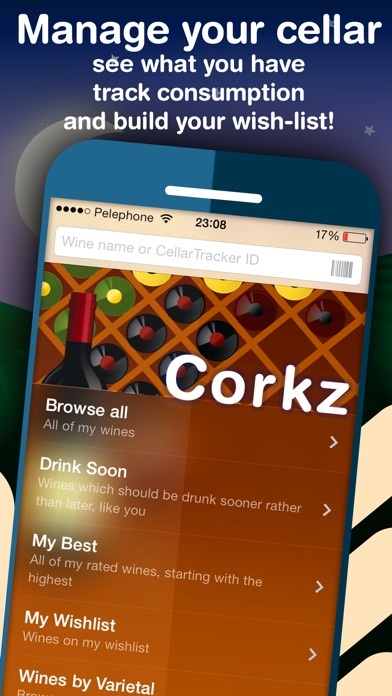 Your app purchase gives you access to the members only Cellar Tracker website as well, just use the same user ID and password you used to set up your Corkz membership. All seamless and flawless. I find the depth of the Cellar Tracker website to be amazing. Great partnership and wonderful interface. I couldn't ask for more. Thanks for making a FULL BLOWN cellar tracker for me to use on the fly! Love it. Cellar Management doesn't work. Also the library is hard to use. Don't waste your money. Upon the new iOS release the app won't open. Says is loading and never loads. When it did work it worked well with some small issues that the developer could fix before release. Gives me the information I want on a wide variety of wines in excess of 95% of the time. Unable to add wines to my cellar that aren't in the Corkz data base. Just purchased a case of wine at Total Wine and was unable to find a single bottle. Much better iPhone and iPad interface to Cellartracker for logging wines you have drunk. App doesn't open on iPad Pro. It does everything I need It to do. It can search by label picture or by Usb code (which isn't as reliable) I have tried them all paid, free it doesn't matter. This app sorts by varietal, region etc. it tracks my cellar where I bought Joe many I have, cost, date etc. 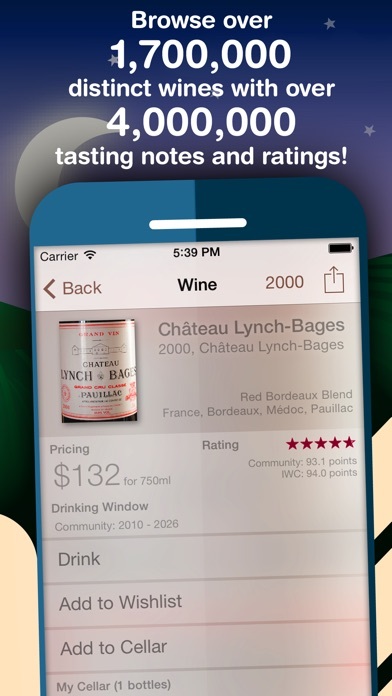 then gives user ratings on wine, a place for private and public notes. The only feature that they do t offer and would be cool would be track the total cost and total value of the entire cellar. Further updates improved app. My go to wine app. Great idea but my inventory is all screwed up. This has been a problem for a while. In addition is doesn't retain order notes when you add a bottle. You have to copy the order notes, save the bottle and then edit and paste your order notes back in and save it again. It's a work around but really? Anybody have a suggestion for a better app? This one stinks. I used to love this app. In the last year or so, though, it either crashes or won't start on a frequent basis. It's unfortunate because the app is great when it works. It used to be my go to app for logging wine purchases. Now I use the Cellar Tracker app instead.